Most dogs do not require anesthesia during an abdominal ultrasound because it is a painless procedure. While the reasons you are getting a detailed look at your pup's inner workings are medical in nature, looking at his internal organs via real time ultrasound technology is fascinating. Ultrasound results are immediate, giving your vet a head start on resolving Fido's health issues. An abdominal ultrasound is way of looking inside your four-legged friend's body without having to perform surgery. The ultrasound machine aims sound waves into the body of your dog. These waves echo back, forming a picture of the tissue and structures they went through. It has grown in popularity as a diagnostic tool for veterinarians because of its non-invasive nature, not requiring Fido to recuperate from a surgical procedure. Vital organs in the abdominal region are studied via an abdominal ultrasound. 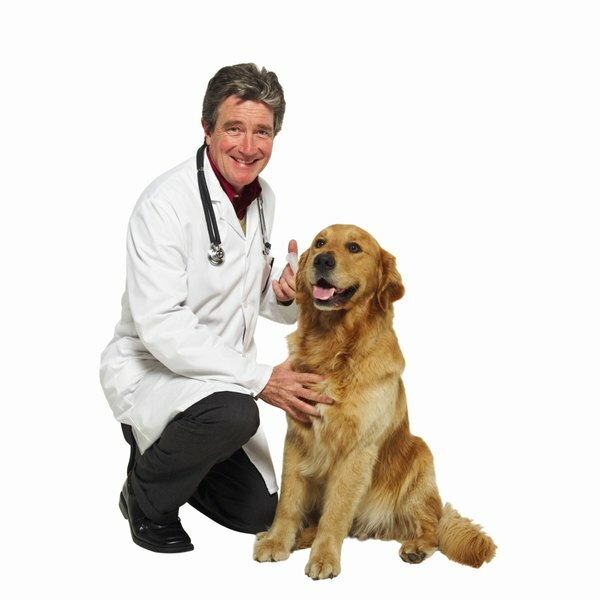 The list of organs includes the liver, spleen, stomach, intestines, kidneys, bladder, uterus and prostate gland, according to PetPlace.com. Not only does an abdominal ultrasound give an accurate cellular level depiction of the current status of any of these organs, it also allows for the detection of changes in shape, size, tissue density, internal structure and the position of the organs. It also reveals the presence of any abnormal tumors or masses. There are many reasons, or what veterinarians call "clinical symptoms," to order an abdominal ultrasound for a canine. Any time blood work results turn up abnormal, veterinarians want a closer, more detailed look at activity within the body. Other reasons cited by the Veterinary Teaching Hospital at the College of Veterinary Medicine at Illinois include: weight loss with no change in eating habits, chronic vomiting, diarrhea or other infection not cleared up after regular treatment, change in urinary habits, a pre-surgical glimpse to better guide the procedure and as a baseline as a dog ages. As upsetting as this is to some human companions who pride themselves on Fido's appearance, abdominal ultrasound does require a close shave. As explained by VCA Animal Hospitals, ultrasound waves do not transmit through airwaves. Fur has a lot of air in between each hair strand. It is essential that the hand-held probe used to send the sound waves and detect the returning images makes complete contact with the skin. In most cases this isn't possible even with an excessive amount of ultrasound gel if the pup's hair is in the way. VetInfo indicates that any type of canine ultrasound costs anywhere from $300 to $500 depending on what region of the country you live in and whether or not a veterinarian or a technician performs the procedure. PetPlace.com says that most veterinarians refer canine patients needing an abdominal ultrasound to a specialty clinic offering the procedure. This is because ultrasound equipment is expensive and efficient operation of it requires additional training. VetInfo: What Does a Dog Ultrasound Cost? DVM360: Research Update: Is Abdominal Ultrasonography a High-Yield Diagnostic Test in Dogs with Chronic Vomiting?